The camera assembly is approximately 14 feet long and is secured to the inner telescope ring by the spider. The components of the camera are readily recognizable by comparing this photograph with those parts shown in Fig. 1. The Dark Energy Survey (DES) needs to observe hundreds of millions of galaxies to achieve its science goals. 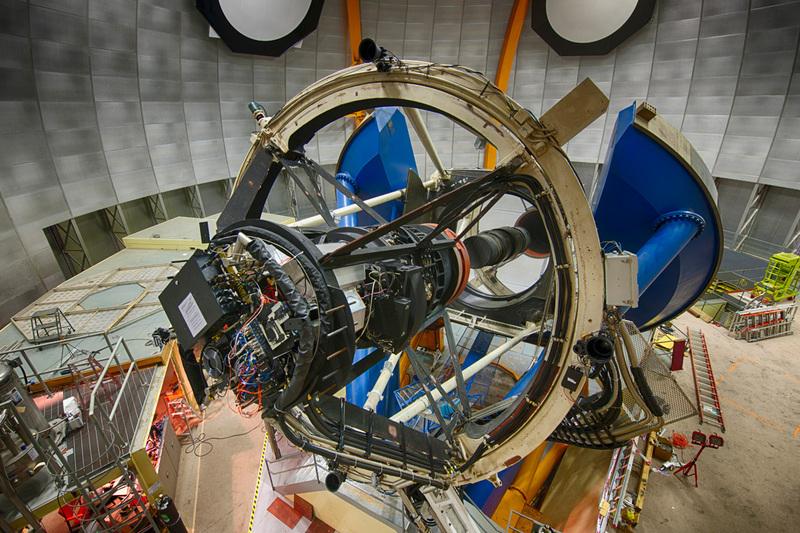 The state-of-the-art Dark Energy Camera (DECam) was designed and built from 2004 to 2010. Scientists at the Fermi National Accelerator Laboratory led the project, which was primarily funded by the U.S. Department of Energy, along with significant contribution from US universities, the United Kingdom, Spain, Brazil, Germany, and Switzerland. Just as DES is an international collaboration, DECam is an international camera with components built in five different countries. 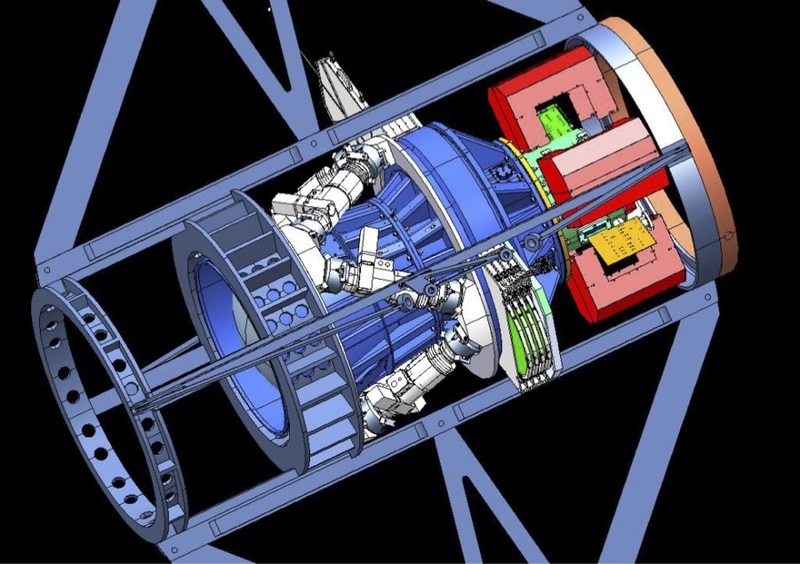 The science requirements of DES drive the construction of the Dark Energy Camera (DECam). DES will look deeply into the universe, observing galaxies at great distances to record their motion and conditions in the distant past. To do this, DES needs a camera which will view relatively large areas of the sky at once while being sensitive to the redshifted light from these distant objects. Everything about DECam is large-scale, including its field-of-view; about 14 copies of the moon would fit on the focal plane! 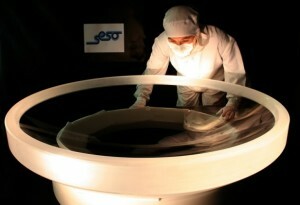 The first and biggest of DECam’s lenses is nearly a meter (3.3 feet) across and weighs 176 kilograms (388 pounds), making it the largest optical corrector component currently used astronomy. The Dark Energy Survey records images using five filters, spanning 400 nm to 1080 nm. Each filter images the sky in a different color of light. With a 62 cm (24 inch) diameter, these too are the largest in use in the astronomical community. The images themselves are taken on a focal plane that is populated with 62 specially designed, state of the art CCDs, whereas ordinary digital cameras contain up to a few CCD. DECam can be read out in 20 seconds, faster than most CCD cameras currently in use in astronomy. The Dark Energy Camera design. The prime focus cage and support “spider” provide the frame that connects the camera to the upper part of the telescope. Focus and alignment is provided by a 6-arm “hexapod” (white) that connects the cage to the “barrel” (dark blue), which houses the corrector optics. The optical corrector is oriented as if the primary mirror was to the left of the camera. The filter changer and shutter are housed in the barrel just to the left of the hexapod. Some filters (green) protrude out of the barrel. The CCD imager Dewar in the upper right (also green) is mostly obscured by the readout electronics crates (scarlet). DECam construction started in 2008 and was finished in 2011. It was first assembled and tested at Fermilab on a full-scale reproduction of the telescope top-rings that we called the “Telescope Simulator”. The camera and its infrastructure support hardware were delivered to CTIO in a series of shipments from 2010 to late 2011. 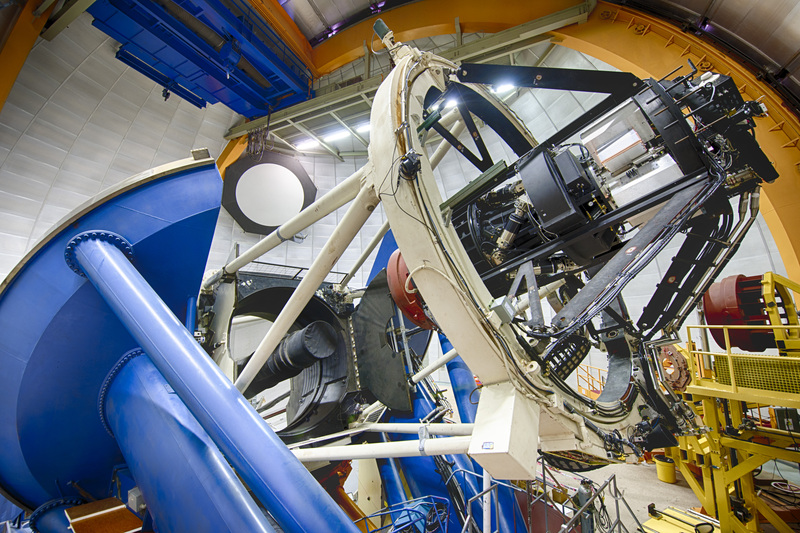 The Dark Energy Camera mounted on the Blanco 4m telescope at CTIO. The telescope’s mirror is just out of the photo, low and to the left. The Blanco telescope has a 4-meter (13 feet) diameter mirror, which weighs 34,000 lbs. This is relevant because the sturdy telescope structure can support the mass of DECam and the wide field design of the mirror provides one of the few existing platforms for efficient wide field surveys. The Cerro Tololo Inter-American Observatory (CTIO) led the camera installation with intense and active participation by the DECam design and construction team. Installation started in January 2011 and was completed in September 2012. Fig. 2 shows a photo of the Dark Energy Camera mounted on the Blanco telescope. The “Official First Light” ceremony was held on September 12, 2012. Within 45 minutes of its first exposure, DECam was already delivering promising, quality images. Fig. 3 is a 3-color composite image from the first light night. DECam was commissioned during September and October 2012. A survey and instrument testing period called “Science Verification” was carried out by the DES Collaboration and other “community astronomers” from November 2012 to February 2013. This period was used to commission the camera, re-commission the telescope, and verify that the camera and telescope could produce the high-quality exposures required for the survey. DES exposures are transmitted via the internet to National Center for Supercomputing Applications at the University of Illinois at Urbana-Champaign for processing with DES science software. The science requirements of the Dark Energy Survey drive the construction of DECam. The 570 Megapixel camera will hold 74 CCDs constructed specifically to be sensitive to the redshifted light from distant galaxies and stars. DECam will have the widest field of view in the NOAO ground-based optical/infrared system of imagers. Its 2.2 degree field of view is so large that a single image will record data from an area of the sky 20 times the size of the moon as seen from earth. This wide field of view requires that DECam use a system of five lenses, each one uniquely shaped to correct a variety of optical aberrations, with the biggest of these lenses being almost 1 meter in diameter. a hexapod adjustor to provide stability. Imager with all 74 chips, totaling 570 million pixels. In concept, these are the same devices that make up the heart of any home digital camera. However, unlike home cameras that are used to record images of things that are very bright, astronomical CCDs must be souped up in order to detect the tiny amount of light that reaches us from faint and/or distant objects. Much of the light from extremely distant galaxies and supernovae has been redshifted into long-wavelength red and infrared light, which conventional CCDs do not detect very well. DES will use CCDs that engineers at Lawrence Berkeley National Laboratory (LBNL) specifically designed to observe red light from distant galaxies. For example, the chance of detecting long-wavelength light is increased when it travels through more silicon, so DES CCDs are about 10 times thicker than conventional CCDs. 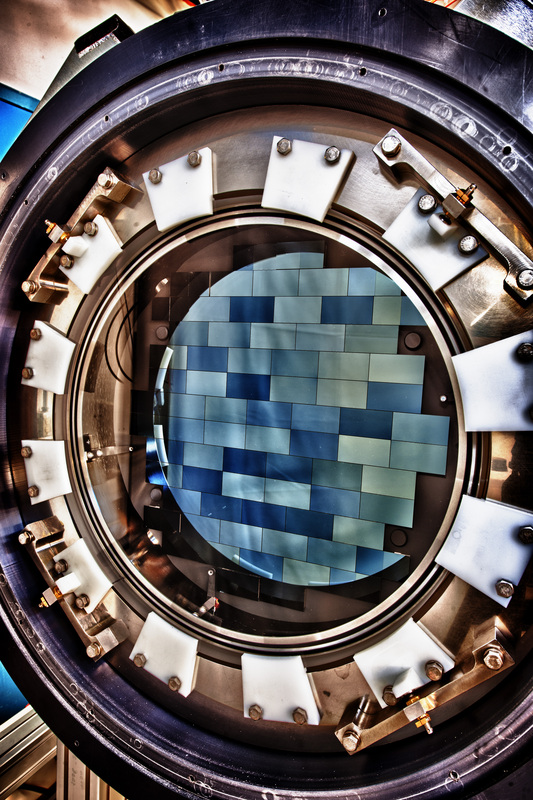 The DECam focal plane will consist of a science array of sixty-two 2048 X 4096 CCDs. Additionally there are four 2048 X 2048 guider CCDs and eight 2048 X 2048 focus and alignment CCDs. The quantum efficiency of these LBNL-designed CCDs with their anti-reflective coating is red optimized to be > 90% at 900nm and over 60% over the range of 400-1000nm. The DES CCDs were fabricated by Dalsa with further processing done by LBNL. They were then packaged and tested by Fermilab. DECam will operate at -100oC in order to minimize noise and dark current with the cooling provided by liquid nitrogen. To prevent condensation on the surface of the CCDs, DECam will operate at that the extremely low vacuum pressure of 10-6 Torr. The optical corrector system is a Wynne-style five lens, two asphere design. It provides a 2.2 degree field of view image at 0.27″/pixel while contributing less than 0.3″ FWHM to the image quality. The lenses were cast by Corning in New York and were polished by SESO in France. The biggest of these lenses will be 98 cm in diameter and will weigh 380 pounds. The cartridge-style filter changer holds up to eight filters, which, at 62cm in diameter, are the largest produced. DES will use five filters, which astronomers have designated g, r, i, z, and Y. Each will let through a relatively broad spectrum of colors, such as red light, green light, or blue light. By comparing the relative amount of light detected through each filter for each object in an image, astronomers can make a very good estimate of the redshift of each object. 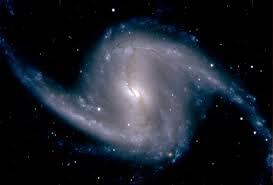 (For more information on the meaning of a galaxy’s redshift and how DES will estimate it for each galaxy, click here.) These filters were manufactured by Asahi Spectra, headquartered in Tokyo Japan. The shutter, manufactured at Bonn University in Germany, is the largest shutter of its kind. The filter changer was manufactured at the University of Michigan. The hexapods provide a real-time focus and alignment system to maintain high image quality. They were manufactured by ADS International in Leco, Italy. The electronics will allow an entire digital image to be read out and recorded in 17 seconds, a very short period for an image of this size. This will allow the camera to be read out in the time it takes the telescope to move to its next viewing position. The noise of the readout system will be so low that while an image may produce a full-well specification of 130,000 electrons there will be less than 25 electrons of noise in each pixel. The electronics will record the data in the form of a mulit-extension fits (MEF) file and will also provide real-time instrument health and quality checks.